This innovative helper saves you time and staff expenses when transporting and mounting furniture. Ideal for transporting doors, partition walls, sheet materials and structural components with a maximum thickness of 100 mm and a maximum weight of 200 kg. The easy and safe operation of the device during transport helps prevent material damages. Fatigue and back pain are minimised due to the ease of operation of the device, therefore reducing health risks and their associated costs. 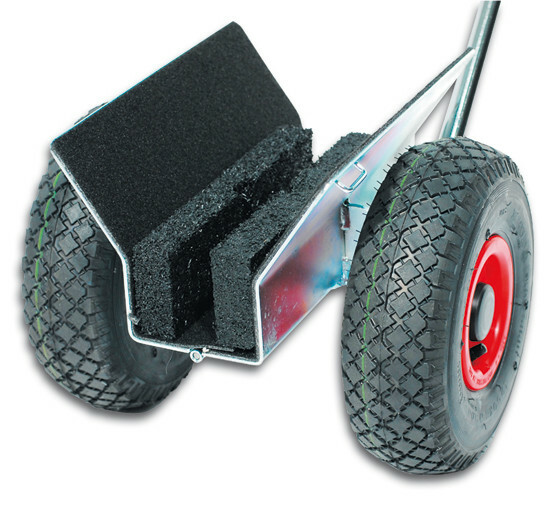 The transport carriage has a sturdy construction and is equipped with pneumatic tyres, also suitable for use on uneven ground, e.g. at construction sites. The equipment also includes a 4 m tension belt for connecting carriage and transported goods and a guiding aid for smaller parts.